This is from last year, but I shamelessly bring it back to the top for 2011! I mentioned this song from the Pirates of the Burning Sea Christmas event a few days ago. It’s been stuck in my head ever since, so I thought today I’d have a crack at making a little video for it so it can get stuck in your heads too! “The Wren” is a traditional Irish wassail. Like any such song, there are a lot of variations in the lyrics from place to place. The version PotBS is using works pretty well though! I was really running up against the limitations of Windows Movie Maker with this one. Getting the timing for the scene changes semi-decent was a bit of a nightmare. I hope you enjoy it anyway! I’ve just started some new medication, and it’s giving me some fairly impressive dizziness and nausea. It’ll most likely just be for a few days while my body is getting used to it, but it does mean that I’m less than eager to go running around in phase 5 of Rift’s Beta test. Hopefully we’ll pick up the liveblog in phase 6. This post is far too short. Help me out, Mr Reeves! Unbelievably, that’s really the only video of that performance I could find. Still awesome though! I’m still alive! Just not feeling very opinionated at the moment. I’m working on a couple of little bits and bobs that might come to light at some point, and, of course, the Rift Beta will be heading into phase 5 on the 25th of January and I’ll be there to tell of what I encounter in another episode of my Beta liveblog. Update: This is the biggest decision I’m planning on making today. 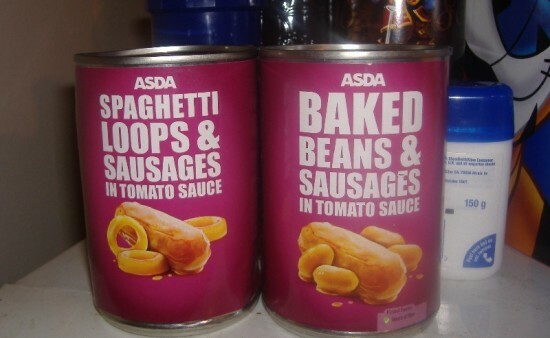 Tinned Sausage Decisions. Tony the Tiger looks on with interest. I just took that pic to show a friend, but while taking it, I noticed something bizarre. It’s the same sausage in both pictures!!! Did they carefully pick the baked beans off it, and then artistically drape it with spaghetti rings, or was it Photoshopped? I have to know! London New Year 2011 Firework Display Video!!! Happy New Year from Greenwich Mean Time! London had a spectacular firework display on the Thames, with the Houses of Parliament, Big Ben, Tower Bridge, and the London Eye in full view. For the first time, it was set to a musical accompaniment starring the best of British. Queen, T-Rex, the Beatles, and the Clash to name but a few! In the interest of getting the most out of the taxes spent on it (well worth it, mind you), it seems appropriate to share it with the world!!! Happy New Year, and Mind The Gap!!! We’re moments away from the start of the Ashes, the biannual series of cricket matches between England and Australia. We’re down in Australia this time around, so my sleep patterns are at risk, but I don’t care. It’s going to be a winter of hope and pain, beefy sixes, and outrageous referee decisions!!! I may be a little distracted for a while,but that’s alright! Let’s celebrate with Mr Duckworth and Mr Lewis, and their fine musical stylings! Test Match Special has begun. Geoffrey and Aggers are discussing our chances, and we’ve won the toss. Let the games…*clang* BEGIN!!! As most of you know, I’ve been doing work for the BBC for a decade or so, but I’ve been a staunch supporter and fan of the Corporation since long before I ever had any connection to it, and I get quite nervous – and more than a little angry – when the knives come out for the BBC, as they very much have been of late. It’s particularly annoying since the Beeb, as a public service broadcaster which is (in effect if not strictly technically) more or less publically funded, is never in a position to defend itself, even against its most partisan critics. It’s sometimes hard to explain to non-Brits how central the BBC is to the life of our nation. I feel an attack on the BBC almost as if it was an attack on a member of my family, which is a bit of a problem considering the BBC is attacked constantly. The BBC is under threat like never before, with talk of privatisation. The BBC can’t defend herself due to impartiality rules, and most other media outlets (especially those owned by Mr Murdoch) have their own reasons for wanting her destruction. The hope is that the public will be able to show our support by getting this song to chart when it is released at the beginning of November. I want the BBC to still be around for future generations, and not just another sad tale of something special that was lost.